Looking for the iPad version? Click here! Boom! is a fun Mine Sweeper style game for iPhone and iPod Touch. Find all safe areas in a mine field, without touching any bombs. Suspected bomb locations can be flagged and are safe to touch while flagged. If you do touch a bomb, then it's game over and try again! Version 2.0.2 is available from the iTunes App Store now! 8 board sizes and 6 bomb difficulty levels for each board size. The size and difficulty level can be set in the game's settings screen and are saved on exit. Boom! will never reveal a bomb on the first-touch, the stats be filled with single-touch losses! Game preferences and game states are saved on exit and restored on game start. Statistics of the games played are saved. For each board size and difficulty level the wins, losses and best times are kept and displayed in Boom! 's statistics screen. A new help email address: helpme [at] playspel [dot] com with a button in the game's help and app-internal email form. 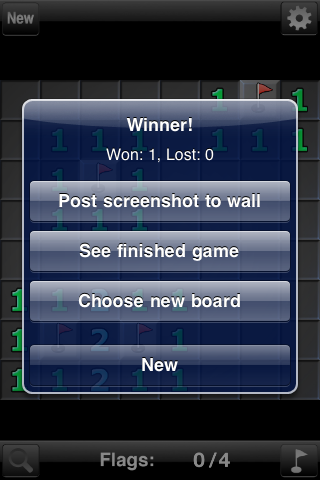 Facebook connect is also used to allow you to write your wins on your wall with more network features on the way! You can upload screenshots to Facebook and also save them to your iPhone or iPod Touch photo album for easy sharing by email or MMS. You can enable individual sounds, if you don't want to hear the mine explode then just disable the explosion sound! A free reduced version of Boom! called Tiny Boom! (now updated to v2 also) is available from the iTunes store! Try the interface and some simple grids and if you want more you can buy Boom! for just $0.99US! Let us know what you think! Buy now for only $0.99US! 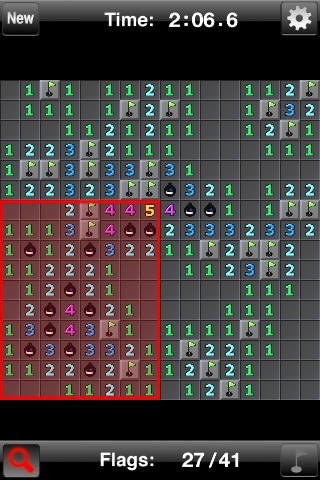 The game is played by selecting covered tiles and then picking other safe tiles to reveal by looking at the bomb numbers indicated on the revealed tiles. Arrows on the edge of the game board mean there are more cells in that direction that you can scroll/drag to. The cog takes you to the settings, help, Facebook and statistics screens. Starts a new game, loses the current game if there is a game in progress. Toggles between play mode and grid overview mode, only in play mode can you touch cells. In zoom mode a red overlay can be moved to select an area to zoom to in play mode. 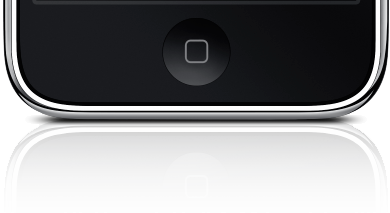 Toggles between flag mode and play mode. During flag mode all covered cells turn green and you can then either remove a flag or set a flag. When a flag has been set you can touch that cell safely. In addition to using flag mode to set flags you can also use hold-to-flag mode (set in settings screen). Shows how many seconds you've been playing the current game. Shows how many flags you've used. You can use as many flags as there are bombs. A covered tile, could hide a bomb! An uncovered tile with no neighbouring bombs. Uncovered tiles indicating the number of neighbouring bombs. Press "back" to go back to the game, "new" to starat a new game. Use the picker to choose your grid size and bomb difficulty. The real size and bomb numbers will be shown below the picker when you make a selection. Turn this on to play timed games, a timer will be shown at the top of the screen and your best times will show in your stats. Enables hold-to-flag mode. Touch a cell (which will turn red) and then hold it for half a second (0.5s) and it will turn green indicating you can let go and the cell will be flagged. Only available when hold-to-flag mode is active. Set this to on to shorten the hold-time to a quarter of a second (0.25s). Enables double-tap to reveal a cell, an extra bit of safety. Turns a cell red until you tap it a second time to reveal or you tap another cell. This toggles single flag mode for the game's flag mode button. When turning on flag mode it will turn off after marking a single cell with a flag. To allow any sounds set this to ON, individual sound settings override this. When ON an explosion will be played when toucing a bomb. Set to ON to hear the fanfare when you've won, for that classic touch. set to ON to hear a whooshing sound when you flag a cell. Set to ON to hear a click or echoing click when revealing cells. When ON you will hear a 'ding' sound when a new game is started. For audio feedback when touching UI buttons set this to ON. Set to ON for vibration when a bomb is touched. If set to ON then the game grid will have a higher contrast which can be more readable in sunlight. If set to ON then screenshots taken for Facebook wall posting will also be saved to your iPhone or iPod Touch photo album. If set to ON the red box showing the visible are will be drawn to screenshots. To clear all statistics stored in Boom! 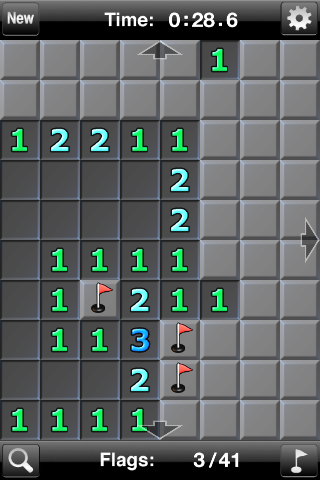 Minesweeper press the "Clear all statistics" button. Be warned: this is not reversible, press this button and your stats are gone. Tap the various buttons to switch between Settings, Stats, Help and Facebook screens.